The president of the Catholic Bishops’ Conference of India called for upholding constitutional guarantees of freedom of religion in response to a government official’s push to separate people because of their faith. “The country is facing different challenges, like making sure the constitution is really kept (observed) in the life of the citizens. Constitutional guarantees should not be blocked from any corner,” said Cardinal Baselios Cleemis Thottunkal, major archbishop of the Syro-Malankara Catholic Church. Speaking during a news conference on 1 February ahead of the biennial assembly of the bishops’ conference, Cardinal Thottunkal said Dalit Christians were being denied the same rights as Hindus and other Dalits. “Religion should not be used to deny equal rights,” he added. Dalit means “trampled upon” or “broken open” in Sanskrit and denotes people formerly known as untouchables in India’s multitiered caste system. The government introduced free education and a quota in government jobs for Hindu Dalits in 1956 to improve their social status. While the same statutory rights were later extended to Buddhist and Sikh Dalits, the demand for equal rights for Christian Dalits has been rejected by successive governments. “People in responsible positions should not sideline the sacredness of the constitution,” Cardinal Thottunkal said when asked about a federal official who urged that the constitution be amended to have people identify by religion. Cardinal Thottunkal also cited a pre-Christmas attack on Catholic carol singers in the Diocese of Satna and threats against a Catholic college in Vidisha in the Diocese of Sagar as examples of violations of the constitution's freedom of religion principles. Similarly, he criticized earlier controversial decisions of the Modi government to observe Good Governance Day on Christmas and Digital India Day on Good Friday 2017. The Didos family of Lviv — displaced after shelling destroyed their neighborhood in the Donetsk region of Ukraine — share a moment of happiness on a cold Sunday on their way home from church. 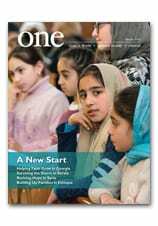 Read about the plight of The Displaced from Ukraine in the March 2017 edition of ONE. A Syrian child uses a stainless-steel pot to bale out water from her tent at a refugee camp on the outskirts of Zahle in Lebanon’s Bekaa Valley on 26 January 2018. Editor’s note: We were delighted to receive this note from Joseph Hazboun, regional director for Palestine and Israel, describing how a grant from CNEWA is helping a group of religious sisters care for the elderly in Bethlehem. At the Antonian Charitable Society, Sister Caterina, responsible for the kitchen and Sister Lizy, Mother Superior, were overwhelmed with joy when the society’s large old rainwater cistern was repaired and cleaned, and made ready for the winter rainy season. The cistern stood neglected for years and the society relied solely on Bethlehem’s water network. That could be problematic. Piped water was often shut off (due to water shortages) or made prohibitively expensive, due to price increases because of a longstanding drought. Rainwater cisterns are common in Bethlehem and other urban areas and are in fact, an ancient method developed and perfected by the Nabataeans. They began to appear in Palestinian cities during the Assyrian period. Since then, the rainwater cistern was always a practical way for locals to have access to potable water, especially in the summer months. As technology advancement and urban growth became apparent in the past half century, many Bethlehem residents and institutions moved away from these ancient practices of channeling and collecting rainwater and utilized the water system as the main source of potable water. In recent years however, a severe drought has decreased water reserves throughout Bethlehem. Last summer, Bethlehem had a water shortage that lasted more than a month, as reserves reached all-time lows and water tanker trucks became the only method of distributing potable water. For the Sisters at the Antonian Charitable Society, that meant their water bills were soaring last summer — far higher than what they had budgeted for. As part of CNEWA’s efforts to care for the marginalized, a grant was provided to the Sisters of the Antonian Charitable Society in 2017 to provide photovoltaic solar panels. These could generate free solar electricity to operate medical equipment, lights and kitchen appliances at the society. That grant also eliminated the society’s reliance on piped water and water supplied by trucks through the rehabilitation of the society’s old rainwater cistern. The grant also enabled the installation of hydroponic units for the kitchen to grow organic vegetables. This is an alternative method that feeds 50 elderly members and 29 women residents daily, saving much money on groceries. There is also enough water left in the cistern for household cleaning and bathing. The sisters have expressed their gratitude to CNEWA for helping to make these practical solutions a reality — and they are especially grateful that they can continue to provide services for the elderly in Bethlehem. Editor’s note: CNEWA is privileged to support numerous initiatives and institutions that serve marginalized, poor and vulnerable populations in Egypt. One such establishment, called Good Samaritan, comprises two facilities that provide care for children in need. CNEWA helps Good Samaritan centers to shelter, feed and clothe children whose parents have died or are too poor to afford these necessities. We also help share the gift of education with underserved children in areas where schools are scarce or unaffordable. Michel Constantin — our regional director in Beirut, who oversees our work in Egypt — recently shared this story of one family benefiting from these on-the-ground services. Wagdi Attallah is 17-years-old and suffers from asthma and lung problems. His family consists of his mother and himself. Before Magdi was born, while she was pregnant, she had health complications which affected Wagdi’s present condition and requires chronic medications. His mother now suffers from many problems with her eyesight. Their main source of income was from selling buffalo milk, but after the buffalo died, they lost that revenue and became poorer and poorer. Their house was in extremely poor condition, with just two small rooms. There was no toilet or kitchen. Through a project supported by CNEWA, and in collaboration with the Good Samaritan Center, we were able to improve conditions for Wagdi and his sick mother. The house was rehabilitated. A bathroom and kitchen were built, along with concrete and tiling to repair the house. We installed doors and windows and painted the walls, and also did some electrical work on the building. Wagdi’s condition has improved dramatically. He is now studying for his diploma. We are still there to help him as needed — supporting him with assistance in his health care and education. Thanks to the generosity of CNEWA’s donors, his future now looks much brighter. Despite decades of official atheism, Christian symbolism is compellingly strong in central and eastern Ukraine, which is why many are cautious to enter dwellings where Greek Catholics worship: The buildings often lack the proper symbols and icons. In the 700-strong village of Mala Vilshanka, the Rev. Ihor Hrishchenko...is blessed with two enormous rooms inside an abandoned, run-down Soviet-era facility once used to develop new grain seeds. He celebrates the sacraments regularly with about a dozen parishioners — although as large a group as half the village comes out on Epiphany to bless water in January — yet the small community “wants something of its own,” he says. Still, the parish has the luxury of a separate room for social events and gatherings crucial to building a parish community. Father Hrishchenko uses the space for screening films, putting on plays and inviting guest lecturers to speak on such topics as marriage, ethics and holidays. “Even though there is the internet and people can instantly access information, it’s more useful to have a ‘human library,’ an expert to talk about the Holy Scripture and other topics,” he says. The 35-year-old priest also leads another parish in neighboring Bila Tserkva, comprised of some 40 faithful who gather inside a dilapidated Soviet-era household goods store — a brick building with a crumbling façade. For two years, when he had no car, Father Hrishchenko would take the bus to the village parish and then hitchhike back to the district center in every kind of weather. Such concessions are necessary when resources are tight. The average Ukrainian monthly salary barely reaches $200, and diminishes as one moves farther away from urban centers. Read more about how Catholics are Planting Seeds, Nurturing Faith in Ukraine in the December 2017 edition of ONE. In this image from 17 January, residents walk through the Burj al-Barajneh refugee camp. Many have expressed fears over their future after the U.S. cut aid to the U.N. agency that supports them. Bishop Felipe de Jesus Estevez of St. Augustine, Florida, holding cross, and Auxiliary Bishop Alberto Rojas of Chicago, right, watch a Palestinian worker make crosses made of olive wood on 27 January at the Holy Land Handicraft Cooperative Society in Beit Sahour, West Bank. Retired Bishop Placido Rodriguez of Lubbock, Texas, remembers the smell of woodworking and the feel of wood in his hands from when he was a child in his family furniture factory in Celaya, Mexico. Bishop Rodriguez was among 10 bishops who participated in the 18-27 January USCCB Hispanic Bishops’ Pilgrimage for Peace in the Holy Land. They met with local Christians as well as with other Palestinians and Israelis to get a firsthand understanding of the situation and to advocate for “bridges not walls.” Many bishops said the pilgrimage gave them a better understanding of the Palestinian Christian reality in the Holy Land and gave them the opportunity to express their solidarity with the community, which makes up less than 2 percent of the Palestinian population. On 27 January, Catholic Relief Services hosted the bishops in the traditionally Christian village of Beit Sahour, near Bethlehem, for a tour of the CRS Fair Trade Partner Holy Land Handicraft Cooperative Society, and a visit to one of the artisan workshops CRS recently helped renovate to improve working conditions. Bishop Nelson J. Perez of Cleveland described Gaza with its 2.3 million people as a “virtual human prison,” where residents cannot leave and others cannot enter. While there is a political aspect to the situation, the humanitarian side of it cannot be ignored, he said. Bishop Oscar Cantu of Las Cruces, New Mexico, touches a statue of Mary made out of olive wood at the Holy Land Handicraft Cooperative Society in Beit Sahour, West Bank. He said although the students of Bethlehem University with whom they spoke gave him hope as they expressed desire for peace, their prospects for gainful employment were minimal, and many young Christian Palestinians emigrate because of lack of work.